Help Turky the Turkey reach his sweetheart Picky the Peacock for a romantic date! But you have to hurry: if he takes too long the lady may believe he won't come anymore and leave, breaking his heart... You can help Turky cross the garden by opening new paths in this new sliding puzzle adventure but be careful: Sly the Cat, Foxy the Fox and Otto the Owl are there to catch Turky and make him miss the date! 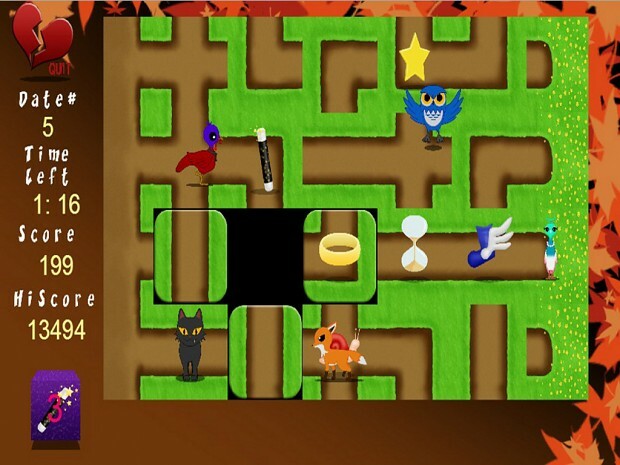 * An original puzzle game combining strategic thinking and quick reflexes that will entertain you for a long time! * Improves your spatial reasoning skills. * Cute graphics and an engaging soundtrack to enhance the playing experience.